Gardai have launched an investigation into online threats made against a garda who policed the ‘Take Back The City’ protest in Dublin last week. Gardai came under criticism as members of the public order unit - who had their faces covered - stood in front of no. 34 North Frederick Street in Dublin city centre while men in balaclavas from a private security group removed activists from the building. It has emerged that one of the gardai present was subject to threats and abusive comments, with his name and picture being shared overnight on social media. The poster allegedly found his details using "facial recognition software". Gardai have confirmed that an investigation has been launched into the post, which made claims about the garda’s personal life. “An Garda Síochána is investigating online threats made against a Garda member working in Dublin,” a garda spokesperson said. “Threats and intimidation against Garda members who are only doing their job to keep people safe and uphold lawful order are completely unacceptable,” Mr Harris said. Communications Director of the GRA John O'Keeffe said that the association "unequivocally condemns" the threats against those working as public servants at the recent North Frederick Street protest, including any derogatory comments. "They have led to vile social media abuse and threats where our members, and often their families are intentionally identified. "The GRA Membership go to work everyday as public servants, equipped with little more than an extendible baton and pepper spray to defend themselves and the public." The Association also acknowledged Commissioner Drew Harris's condemnation of the abuse. "We look forward to working with him to ensure that such threats against our membership and indeed all public and civil servants, involved in the enforcement of court orders, are fully investigated and processed in accordance with the law," said Mr Harris. RTÉ came under fire over the weekend after actor John Connors labelled gardai as “scum” on the Late Late Show on Friday. In the clip, which has since been removed from the RTÉ player, Connors accused gardai of helping “ex-loyalist paramilitaries” to carry out the eviction on North Frederick Street. "RTÉ cut this from their online version. I guess the truth hurts. Scum,” Connors posted on social media yesterday. RTÉ declined to comment when contacted by Independent.ie. 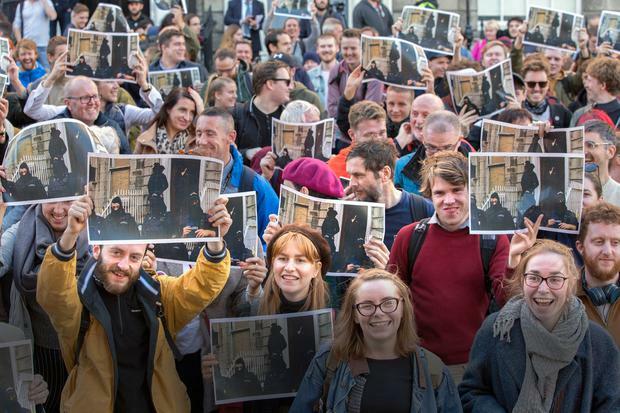 Last week, Mr Harris addressed the issue of gardai wearing hoods during a peaceful protest, saying the form of dress used at the event "was not correct". In a statement released on Thursday, Mr Harris said: "At the start of this event, An Garda Síochána deployed three community policing officers to oversee the safe compliance of a High Court order. "As the atmosphere at the event grew more tense, a small number of public order officers were deployed to ensure public safety. “The use of a fire-retardant hood by public order officers is a matter for the operational commander on the ground and is designed to protect the safety of our members based on a risk assessment. However, the form of dress used at the event was not correct. "I have requested a report from Assistant Commissioner, DMR, to see what lessons can be learnt from the event. Minister for Justice and Equality, Charlie Flanagan, said that the online naming of the garda "serves to highlight the challenges facing Gardaí in upholding the law on our behalf". "Threats against them are threats against the rule of law and not acceptable. I expect the matter will be fully investigated by Gardaí," he said.